Use leftovers: that stir fry and bit of rice that didn’t quite get eaten up, I whizzed the vegetables with hot water and a spoonful of stock powder then added the leftover rice at the end. It’s the same principle as chicken soup: make roast chicken on a Sunday, make sandwiches or chicken salad on a Monday, and soup from the bones and leftovers on Tuesday. You can do the exact same thing with leftover vegetables. 2) Adding a little bit of carb such as teeny pasta (stellete or noodles or orzo) or rice turns the soup from a starter into a main meal. 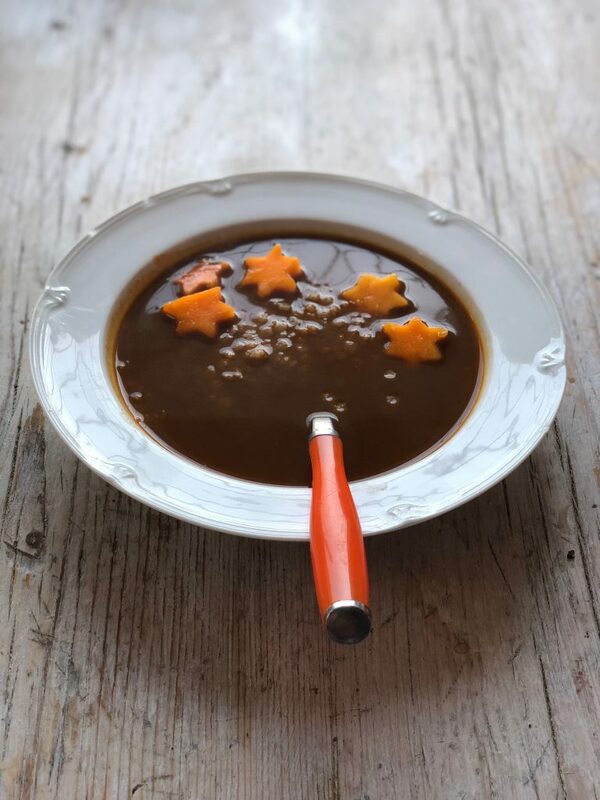 3) Another necessity for a good soup is some kind of acidity: it can be wine, vinegar, lemon juice, verjuice, yoghurt, anything- but it needs something to cut through and brighten flavours. The French used to pour a little of their wine glass into their soup. 4) Add something creamy: either cream, yoghurt, or cheese. A swirl at the end does wonders. 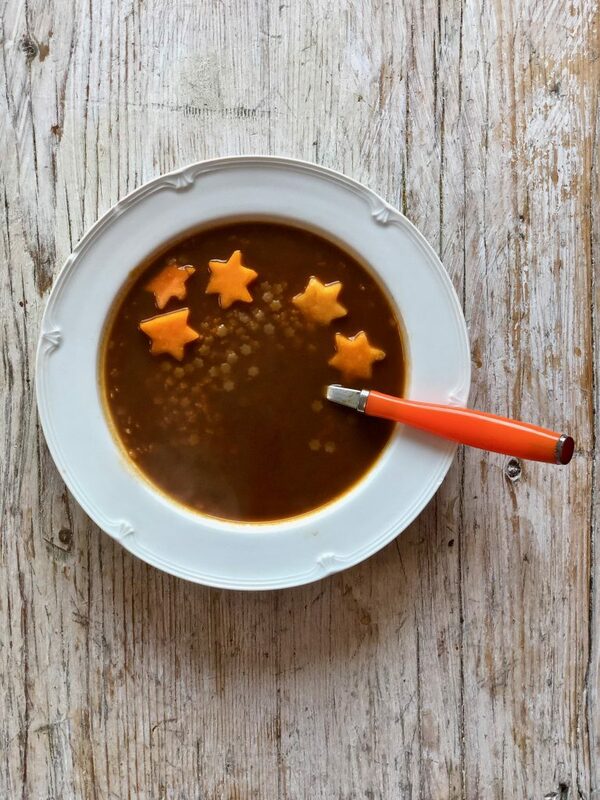 Here is a a made from scratch soup. If you leave out the mushrooms and add more tomatoes, it will look red. Heat up the olive oil in a heavy deep saucepan. Add the tomatoes and mushrooms, simmer for 30 minutes. Strain soup into sieve or chinois. You will end up with a thin and transparent broth. 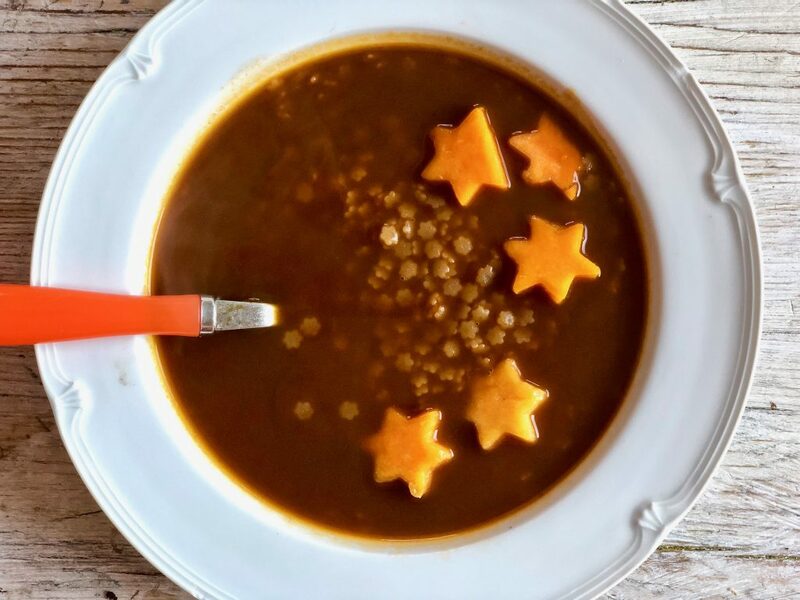 Pour in the pasta stars and the butternut squash stars if using and heat on high for 10 minutes until the pasta is cooked.